Home > e-cigarettes > SMOK > SMOK Kit > Starter Kit > vape kit > Vape Pen > Vape Pen Plus Kit > Would You Like This Pen Style Vape Pen Plus Kit? When we talk about vape, we think of the vape of pen sytle for the first time. It is the shape of the original vape. Even though vape has been developing better and better, the product shape and function are very rich. For example, there are high-powered vape mods to meet our demand for large output, and low-Ohm Tanks give us better enjoyment, but we can't put nostalgia for pen style vape. The Vape Pen Plus Kit is a product that we would like to introduce long ago, because it really brings us pure vaping experience. 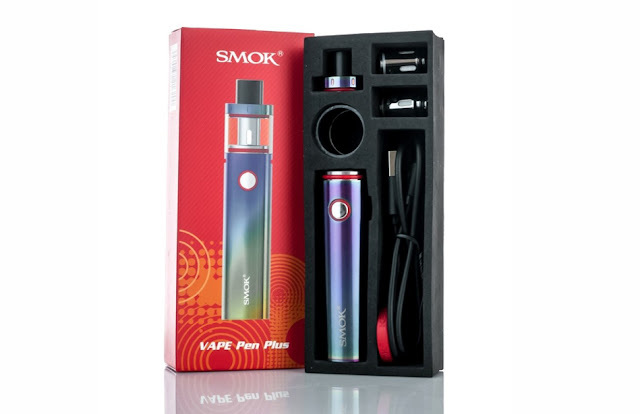 The Vape Pen Plus Kit is powered by a 3000mAh battery that guarantees your long-term use. In front of the Kit is a fire button, all you need to do is press this button, then you can use it, it is very easy to use. Behind the Kit is a charging port. You can charge it by connecting the computer to the Kit with a charging cable. This Kit also comes with a battery indicator, which tells you if it needs to be charged. Vape Pen Plus Kit's Tank can store 4ml e-liquid, and it also supports the replacement of the vape coil so that you can experience a more pure taste. In addition, it comes with TOP-CAP FILLING DESIGN, which makes it easier for you to add e-liquid. The main thing is that it does not have any redundant configuration, just to gain a pure vaping enjoyment.